This week, ADAO had the great privilege of participating in “Asbestos: A Silent Danger?”, an extraordinary conference organized by the Faculty of Political Science, Government and International Relations at the University of Rosario in Bogota, Colombia. We return home a more inspired, connected, and capable organization after coming together with more than 500 stakeholders in the movement to regulate and ban asbestos worldwide. Our fight is now truly an international one, and we are much stronger for it. While this conference accomplished several unique and important feats, two triumphs stand out to us as particularly noteworthy. Attendance numbers provided the first: the conference was so well-attended that its location not only had to be moved to a bigger auditorium two days before it began, but at least two overflow spaces had to be organized at the university for attendees. The specifically political nature of the conference was similarly impressive. In our 15 years of work fighting to ban asbestos, we have never encountered a conference that took such a critical and well-contextualized look at the challenging political landscape surrounding our movement. While the discussions around public health, workplace safety, and labor relations are all equally important to us, we were excited to participate in this conversation through a purely political lens. The conference boasted an unprecedented group of experts and speakers in our field. 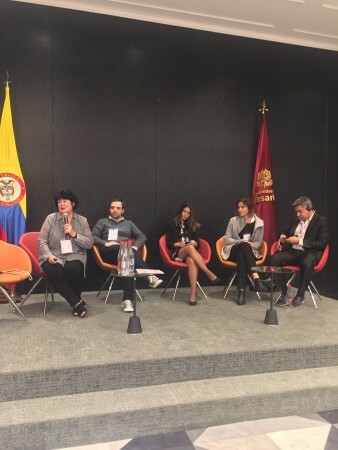 Among the twelve distinguished Colombian attendees were Senator Nadia Blel Scaff; Silvia Gómez, General Coordinator of Greenpeace Colombia, and Alejandro Gaviria Uribe, former Colombian Minister of Health. I was proud to speak as a representative of the anti-asbestos movement in the United States, and was equally pleased to be accompanied by Francis Chateauraynaud, Director of Sociology Studies at the Paris School of Advanced Studies in Social Sciences. 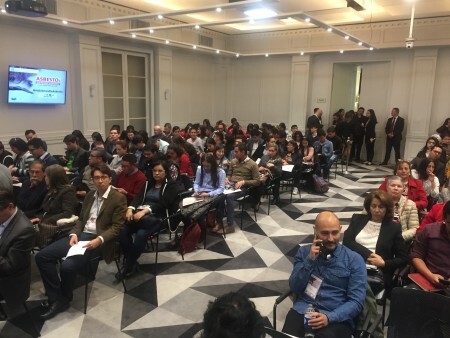 This powerful event occurred alongside the publication of a vital new report from the Observatory of Networks and Collective Action (ORAC), an initiative of the University of Rosario dedicated to studying social movements and political activism on a global scale. The report, which concerned the public debate surrounding asbestos, has already been met with great acclaim. Additionally, the conference featured a screening of the celebrated documentary Inextinguible (“Indestructible”),produced by the IZE Foundation and directed by Felipe Rico Atara. The film exposes the harsh reality of asbestos risks in Colombia via the story of a journalist named Ana Cecilia Niño, whose life was claimed by mesothelioma. Ana’s husband, Daniel Pineda Gonzalez, also spoke during the conference as a representative of the Colombia Without Asbestos movement. Francis Chateauraynaud, Director of Sociology Studies at the Paris School of Advanced Studies in Social Sciences. Alejandro Gaviria, former Colombian Minister of Health and Social Protection. Carlos Agudelo, Director of the Public Health Institute at Colombia’s National University. Juan Pablo Ramos, Associate Professor of the Department of Civil and Environmental Engineering at the University of Los Andes. Esteban Cruz, Member of the Decide Foundation. Nadia Blel Scaff, Senator from the Republic of Colombia, author of the “Ana Cecilia Niño” bill. Andrés Briceño, Assistant Magistrate of the Council of State. Guillermo Villamizar, Director of the Colombia Free of Asbestos Foundation. Linda Reinstein, President, and Co-founder of the Asbestos Disease Awareness Organization (ADAO). Luis Ernesto Gómez, former Deputy Minister, Colombian Ministry of the Interior. Silvia Gómez, General Coordinator of Greenpeace Colombia. Daniel Pineda González, President of the Ana Cecilia Niño Foundation and Director of the Colombia Without Asbestos movement. It is worth noting that invitations to this conference were repeatedly and unsuccessfully extended to representatives of the Colombian asbestos industry. While every effort was made to frame this colloquium as a debate, these declined invitations spoke volumes about the strength of the anti-asbestos argument: the industry did not want to confront this impressive gathering of advocates and academics. We were honored and humbled to be included among them. We are left with a singularly profound takeaway as this week comes to a close: with a collection of people as brilliant and committed as this group, there is strength in fighting together.